Hi, I am interested in your 1971 Chevrolet Corvette (stock #5127-CHA) listed on Autotrader for $51,995. I'd like to get more information about this vehicle and confirm its availability. This is a numbers-matching big block 1971 Chevrolet Corvette convertible, so of course it deserves the mean triple-black treatments. And not only were the colors upgraded, but you can tell that someone with the right eye added the right pieces to make this the vintage Vette that loves the open road. You can always tell when a car has been treated with respect. The panels on this one retain the crisp look that made you instantly fall in love/lust with the Stingray, and the doors of this convertible shut with authority. Plus, the brightwork is gorgeous. It shines to highlight the shark-like front end, large Rally wheels, and artful two-piece rear bumper. 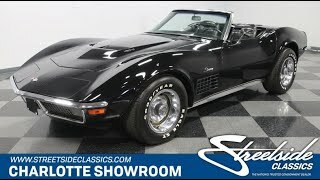 Corvette people know that the factory didnt offer black in 71. But this one was given an upgrade with a slippery application. After all, a big block droptop machine like this deserves to look like a glossy midnight hero. The black folding roof looks great, and so does the full black interior. So not only does this look great with the top up or down, but also you get the ultra-desirable triple-black (exterior, interior, and roof) that everyone WISHED they could have had in 1971. The rich darkness of the bucket seats, door panels, and carpeting allow the accents to pop on everything from wood-like door inserts, to the three-spoke steering wheel. For the driver the essential gauges in front of you with a full auxiliary readout package prominently to the side. This is the kind of classic that will make you want to get out and drive, so you get the right features for all-day motoring. The seats are finished in a supple leather; theres an AM/FM/CD stereo upgrade; and you can stay cool with the top down thanks to factory air conditioning. Lift the hood and see an engine bay filled with big-block power. This 454 cubic-inch LS5 V8 is the cars original numbers-matching engine. The tidy engine bay features the correct details like the Chevy orange paint on the block as well as the bright distributor shield, valve covers, and air topper. Theres nothing quite like turning the key and hearing this monster motor awaken. Plus, you get even more of that great sound with a header package that feeds the stainless dual exhaust. More than just big power, this is built for the grand tour. Thats why you have great driving features like power steering and the original TH400 three-speed automatic transmission. Plus, the Stingray has great features you dont find on many classics, like four-wheel disc brakes and a fully independent sports suspension. The right original pieces and a great triple-back upgrade combine to make a terrific droptop classic. So dont let this big block slip away. Call now!